2017 NSERC USRA award recipients include, front row from left: Renee McDonald, Lara Westhaver, Bailey Malay, and Tiffany Brooks. 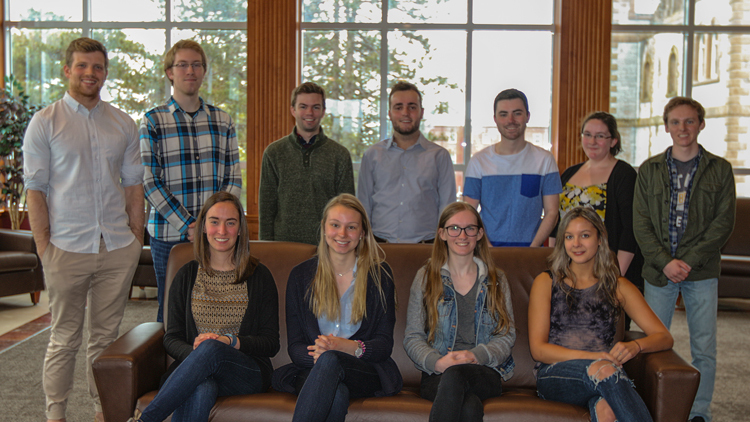 Back row: Oliver Kuehm, Liam Farrell, James Kendall, Matt Martell, Dylan Coakley, Katie MacEachern, and Max Jennings. Absent are Christa Bews, Colin Ross and Melissa Chasse. These undergraduate student research awards, supported by the Natural Sciences and Engineering Research Council of Canada (NSERC) are awarded to outstanding students undertaking research in natural, physical or engineering sciences. To be eligible to apply for an award, a student must be a Canadian citizen or permanent resident of Canada; be registered in a bachelor's degree program; and have obtained, over the previous years of study, a cumulative average of at least second class (a grade of "B" or "B-," if applicable) as defined by the university. To hold an award, the student must have completed all the course requirements of at least the first year of university study (or two academic terms) of the bachelor's degree; have been registered in at least one of the two terms immediately before holding the award in a bachelor's degree program; not have started a program of graduate studies in the natural sciences or engineering at any time; and be engaged on a full-time basis in research and development activities in the natural sciences or engineering during the tenure of the award. These awards have a value of $6,250 inlcuding $4,500 from the NSERC USRA awards which are supplemented by additional funding from the university funds. Click here for full program information on the NSERC USRA awards.
. Those selected for an NSERC USRA (based on subject matter and supervisor eligibility) will then complete required forms on the NSERC's On-line System. All qualified Aboriginal students are encouraged to apply for these awards; these applications can be approved by NSERC beyond the normal quota allocation of awards at any university if self-declared. For more information, please contact: Office of Associate Vice-President Research and Graduate Studies.